Encapsulate the logic used to perform the most common validation tasks into minimal application code. Relieve developers of the requirement to write duplicate code and custom code for common validation tasks. Allow validation rules to be changed after the application has been deployed, and ensure that changes happen simultaneously and consistently. Figure 1 illustrates the interrelationships between the key classes in the Validation Application Block. 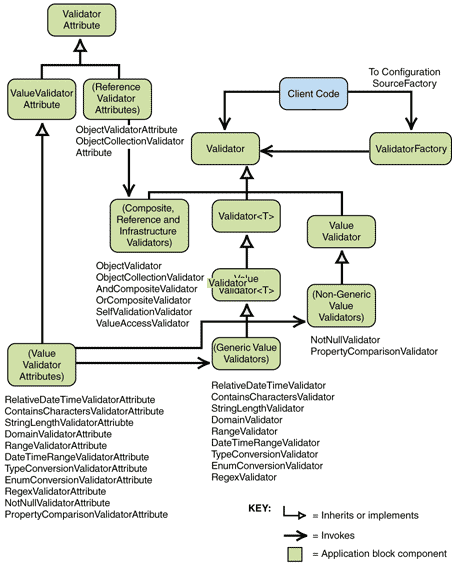 The client code can call the methods of the ValidatorFactory façade to create a validator and validate objects.